I’m on day 3 of my 4-day doctor ordered semi-quarantine & rest, so the idea of a snowy Saturday was absolutely perfect. It would make me feel less bad about not being out and about other than to pick a few things up, and do a few random acts of kindness. 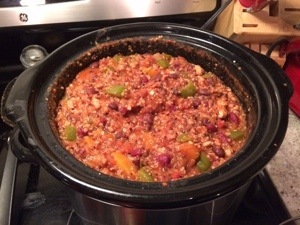 Even though we didn’t get much snow, and it started later than initially thought, it was a good excuse to whip up a crock pot meal that could feed me for much of the week, or freeze for later use. As I’ve mentioned before, I have a tendency of finding recipe inspirations, then adding my own twists to them to make them my own. This recipe is another one of those, inspired by fANNEtasticfood.com, and might be my favorite recipe in a while. It’s hearty, but healthy, and while I don’t like it very spicy, can be dialed up with heat easily, if that’s your thing. 1) Sauté onions & garlic until onions are translucent. Add ground turkey, and begin to brown. 2) Add sauté mixture to crock pot. Add all other ingredients except quinoa. Fill smaller can with water and add to pot. Turn crock pot to high. Simmer for 3 hours, stirring occasionally (could simmer longer on low). 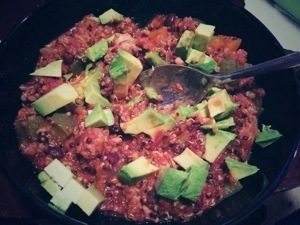 3) When flavors are starting to come together, add quinoa, and continue to stir regularly until it’s fully cooked. Add salt and pepper to taste, and serve. I added diced avocado and it was perfect, but you could add cheese, sour cream/yogurt, or tortilla strips, as well. I am obsessed w/butternut squash! Can’t wait to try this recipe! man I wish we weren’t in summer, I’d give this a go. It’s just going to be too hot to have the slow cooker going for a hot meal. Okay, so was this absolutely delicious because it sure looks like it! I’m thinking I might have to print the recipe and give it a go this week. Or try it, he may like it! Because it’s cooked for so long, you can’t really even tell its in there! Or you could use sweet potatoes instead. Sweet potatoes instead of squash sounds fantastic. Might have to give this one a try!